According to the Texas Department of Public Safety, an accident occurred late Tuesday afternoon on Old Highway 81, claiming the lives of two teenagers, a seventeen-year-old and a sixteen-year-old. The accident occurred after the car, which held an additional seventeen-year-old, went out of control after failing to calculate a curve. The result was that the vehicle went off-road, hit a nearby tree, and caught fire. The accident took place close to the area’s Troy High School. Even though the exact causes of the accident are still being investigated, officials at the Texas Department of Public Safety told local residents to drive in a safe manner when approaching roads with steep curves, such as the ones found on Old Highway 81. In Fort Worth, our roads are generally flat and so it's less common to see curved streets. Because of this, many drivers don't have much experience with sharp, fast curves and may miscalculate the bend, leading to wrecks. This is especially true when it's raining or at night, since slick or hard-to-see roads can increase the chance of miscalculation. When a car takes a turn too quickly, it might veer off the road or flip. Even if the driver manages to keep their car on course, they may "overcompensate," which can also lead to damage or injury. Usually, a wreck caused by a steep curve is the driver's fault. However, poor signals or badly designed roads can sometimes be the city's fault. In these cases, it's wise to consult an attorney to discuss your rights to compensation and a potential lawsuit against the city. What Are the Laws Regarding Texas Curved Roads? In Texas, it's required that all steep curves be marked plainly by reflective turn signs. Often, curved roads will also have a recommended speed limit. The curve sign (Wl-2R or 2L) is used where the recommended speed on a curve is over 30 miles per hour, but under the regular speed limit. Additional protection may be provided by use of the Advisory Speed plate. 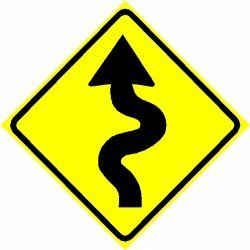 The reverse turn sign marks roads that have more than one curve in a row. When there are three or more curves in a row, the winding road sign will be used. This sign is used to mark sharp changes of alignment in the direction of travel, and must be at right angles to approaching traffic. To be effective, the sign must be visible at 500 feet. Trials should be done at both day and night to check the visibility of any large arrow signs. This is not a complete list of signs and regulations used by the state of Texas to mark sharp or steep curves. If you have specific questions about your accident case, you can contact Attorney Mark Anderson (free of charge) online or by phone to ask your question. Passengers in cars who were injured in a curve-related wreck have a right to claim compensation (file a claim against) the driver, even though they were in the same car. This is the reason drivers carry liability insurance. The money a passenger is entitled to includes money to pay for medical bills relating to the wreck, lost wages from missing work due to injuries, and pain and suffering caused by the accident.